All you Harry Potter fans out there have reason to celebrate! 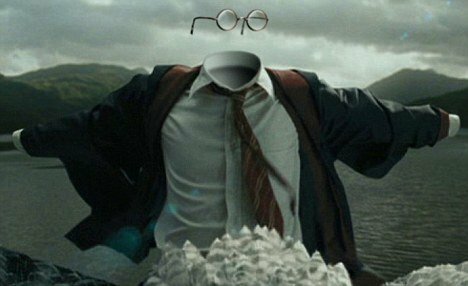 Scientists say they are close to inventing a real invisibility cloth. Harry Potter is a popular book and movie series about a boy who fights evil and wins. His success is partly because of magic tools like an invisibility cloth. When he hides underneath of it, you can't see him. He becomes invisible. Researchers at the University of California at Berkeley say they have invented a cloth that hides shapes. We see shapes when light hits an object. The light then scatters and bounces around to reveal a shape. The cloak is made with millions of tiny mirrors of gold. The mirrors are so small they are about the size of a human hair. The mirrors stop the light from scattering and bouncing. The military would be very interested in this kind of technology, scientists say, as would cosmetic and car makers, too. Xiang Zhang is a materials scientist at the university. "People can make a sizeable belly now become a six-pack, you know, scars on the face and things (that) can disappear." So far, the scientists have been hiding objects so small they cannot be seen with common sight. But they are sure they can adapt the technology for larger objects in the next five to seven years. They celebrate their wedding anniversary annually. In the east, our country adjoins Korea and is close to Japan. Insurance is one of Britain's most profitable invisible exports. Don't scatter garbage all over the place. 1.The cloak is made with millions of tiny mirrors of gold. The mirrors are so small they are about the size of a human hair. The mirrors stop the light from scattering and bouncing. Millions of tons of slag now go into building roads each year. Millions of people were uprooted by the war. 2.So far, the scientists have been hiding objects so small they cannot be seen with common sight. But they are sure they can adapt the technology for larger objects in the next five to seven years. He tried hard to adapt himself to the new conditions. I believe that a good hotel must adapt itself to changing times.